Other English name: Red Fescue. Creeping Fescue is perennial with long, creeping, underground rootstocks, from the joints of which the overground stems and shoots arise. For this reason no real tufts are formed, but more or less extended mats with scattered stems develop. The latter are from eighteen to thirty-six inches high, smooth and round. Secondary shoots arise from buds within the sheaths of old basal leaves. When developing, the shoots break through the sheaths at their base, tearing them into strips. The ragged brown scales and threads, which are always present at the base of the stems and shoots of Creeping Fescue, represent the remnants of the sheaths. Creeping Fescue can easily be distinguished from Sheep's Fescue by these tattered sheaths. The leaves are rolled up in the bud, as in Sheep's Fescue; but while in the latter all the leaves are permanently rolled up, in Creeping Fescue only the basal ones persist in that condition, the stem leaves being flat when developed except in very dry, hot weather. The flowers are in a panicle like that of Sheep's Fescue, although as a rule it is larger and often a little nodding. 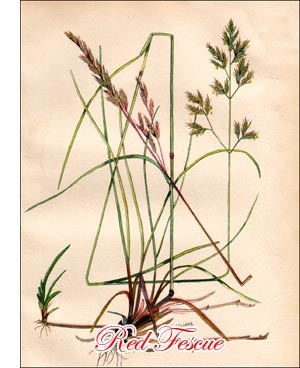 The spikelets, each of which contains from four to six flowers, are variously coloured but often reddish-brown - hence the name Red Fescue. The outer glume of the flower has an awn, which is generally longer than in Sheep's Fescue. It is distributed about the same as Sheep's Fescue. Creeping Fescue grows naturally in meadows and pastures, along seashores and on mountains, and in open fields as well as in woods. It is a little more particular about the soil than is Sheep's Fescue; it does not thrive in extremely dry or too compact land, or where it cannot develop its creeping root system. It does best in loose, sandy or gravelly soil, when sufficient moisture is available. It is fairly resistant to drought, although not in the same degree as is Sheep's Fescue, and it stands severe cold without injury. Its creeping root system being superficial, it is able to develop in shallow soil. Creeping Fescue does not start so early in spring as does Sheep's Fescue. Its nutritive value is highest at flowering time, as the basal leaves dry up or get hard and unpalatable soon after that. It recovers quickly after being cut or pastured and develops numerous new leaves from the underground rootstocks. For this reason it makes a fairly good bottom grass in hay mixtures. Although its feeding value is rather low, Creeping Fescue has some qualities that make it especially fitted for pastures and lawns. It stands tramping and close cutting well and develops firm and lasting mats of tough sod which serve as soil binders on sandy or gravelly land. Dwarf varieties of extra fine texture are cultivated and the seed saved for lawns.